I remember first hearing the trance-inducing debut from Germany’s Daturah a mere three years ago, and it being a turning point in my musical appreciation. I tried punk in my youth, turned to grunge, dabbled in grindcore, withstood drone, and finally settled on the mellow sounds of instrumental music. Through all this appreciation though, there was a thin sediment remaining from each (however brief) encounter. I like post-rock of course, but when it segues into the outer reaches of the predefined genre, that is when it becomes something different. A surprising amount of bands nowadays are sticking to the exact same formula that has earned earlier artists mass praise. 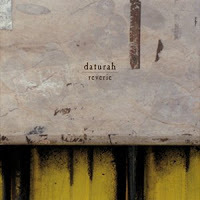 What was different about Daturah's self-titled debut was that it was a heady and invigorating mix of traditional post-rock with a subtle but highly effective dash o’ drone. The difference in their second album, Reverie is that they now display but a fraction of that which made the first listen so appealing, opting instead to travel the dusty, overcrowded route of post-metal. I may be oversimplifying their sounds somewhat, but this is what struck me immediately. After just under two minutes of strange sampled dialogue on opener "Ghost Track," a crushing guitar enters the mix and continues to pummel the listener, letting up only briefly for a few well placed Isis-like guitar delay/reverb moments before returning to aggressive form. While it is indeed a well crafted ambience, it does continue for twelve and a half minutes and even the best of bands can struggle to maintain interest after the first three or four repetitions of such a cycle. What becomes apparent after several listens is that the same fate that befell the first track is repeated throughout every piece on this album: quiet-loud gone mad!